The Department of Theatre Arts and Dance at Loyola University New Orleans kicks off the 2011-12 season with “In The Blood,” Suzan-Lori Parks’ contemporary story based on the main character from Nathaniel Hawthorne's “The Scarlet Letter.” The play will run in Loyola’s Lower Depths Theater on Sept. 30, Oct. 1, 6, 7, 8, at 8 p.m. and Oct. 2 at 2 p.m. Directed by Laura Hope, “In The Blood” tells the story of single mother Hester and her five children, living in poverty and struggling to make ends meet. With a soiled reputation and a dim future, she seizes the opportunity to receive help from her children's fathers. Tragedy unfolds as Hester continues to struggle to find help for her children. All the while, six other characters, all involved in Hester’s predicament, reveal their personal confessions and stories. This play is for mature audiences. Tickets are $12 for general admission and $8 for students, seniors and Loyola employees. 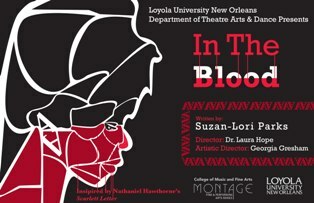 For tickets and information, visit montage.loyno.edu or call 504-865-2074.